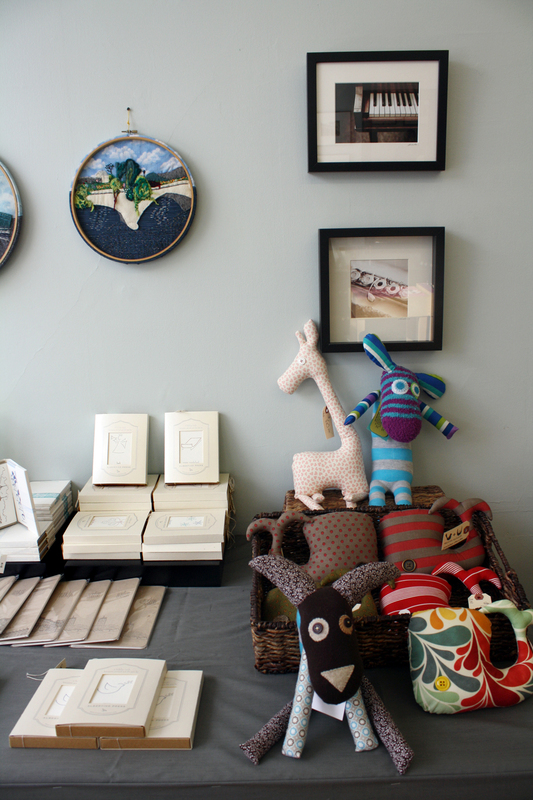 At Boston Handmade we are super lucky to be surrounded by beautiful handmade art and craft every day. Our members are artists of all kinds who sell their work in person at art and craft fairs and also online, mostly through Etsy shops. Our group, Boston Handmade, was formed in 2007 and in 2008 we became an Etsy Team, which is a collection of Etsy sellers connecting around a theme or media category, or in our case, a location. As an Etsy team we have had some wonderful opportunities over the years to interact with other members of the Etsy community, and have worked with Etsy admin to increase visibility for our members on their website. In turn, we have extolled the virtues of Etsy to shoppers and makers every chance we get. 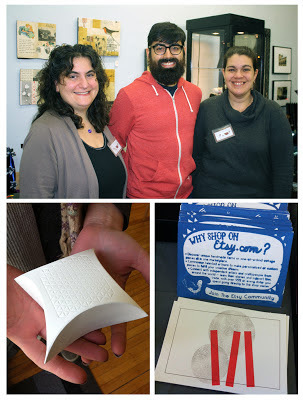 At this year's holiday gallery we had a Grand Opening party on November 17th and also a Get-Yer-Last-Minute-Unique-Handmade-Gifts party on December 22nd. Both events were great celebrations of all things handmade and also a time for us to show our appreciation of our many supporters. At our Grand Opening party we were giving away t-shirts and gift bags, we had loads of yummy refreshments, and tons of Etsy swag for everyone to enjoy! 1. Jessica Burko, John Marc Imbrescia, and Cristina Hurley at the 2012 Boston Handmade Holiday Gallery. 2. The DIY gift box courtesy of Etsy.com. 3. 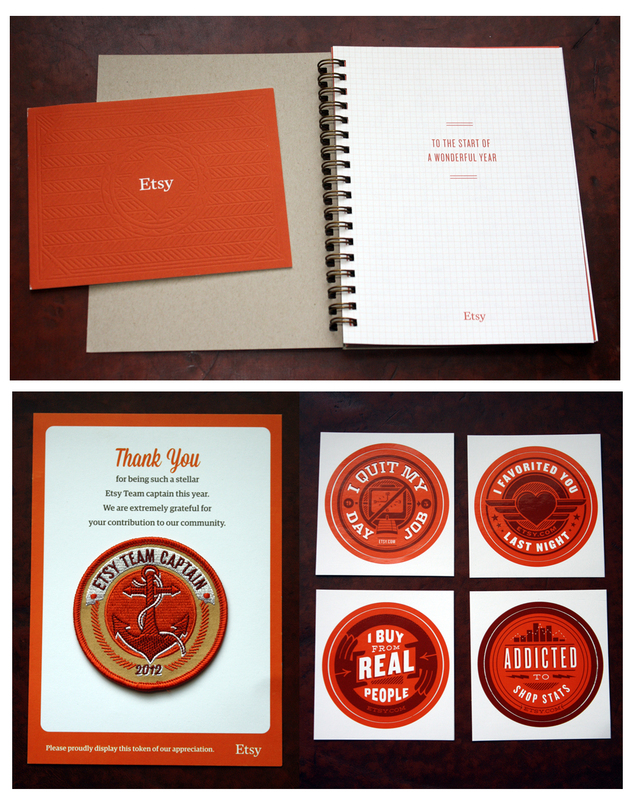 Etsy postcards we proudly distribute to all gallery customers. And as if Etsy didn't do enough nice things for us this holiday season, they also sent us a package of gifts to thank us for being an Etsy Team. Can you believe it?! This lovely gift included handwritten notes of gratitude, a 2013 calendar/journal, a fabric badge, and a pile of stickers and other fun kick-nacks. Want some of your own Etsy holiday cheer? Even though the holidays are now past (sigh) we have lots of special gifts from our Etsy friends to give to customers at the Cristina Hurley Gallery. Just stop by, say hi, and shop local and handmade. ALWAYS.